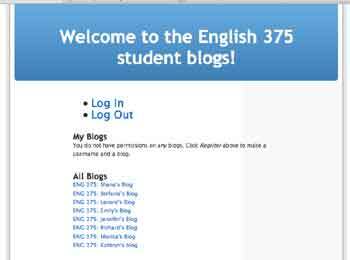 Lyceum is a multi-user blog solution based on the WordPress blog engine (you can read more Lyceum in an earlier post of mine here). I have been tinkering with it for a few months and the developer at UNC Chapel Hill, John Joseph Bachir, has been an unbelievable help it getting me up and running along the way -as have several other folks in the lyceum irc forum like whatup. One of the most impressive aspects of this project, besides the solid program, is the number of online venues they have made available for support. My experimentation was ultimately preparation for a live run, which has just recently started. So, now I am trying to give a little direction to anyone who might want to see how this program is installed, as well as a quick overview of the maintenance and administration involved. Lyceum is a relatively straight-forward installation on most web-hosting services if you do not want to enable dynamic subdomains (which is optional). Enabling dynamic subdomains is not necessarily difficult, but it does require one to make sure they have wildcard dns enabled through the server (something you may have to talk to your web-hosting provider about). I haven’t experimented with the dynamic subdomains yet, so I will not be discussing that part of the installation here. Once you download the latest milestone here, just unzip it and you will have a series of folders named dec, doc, tests, and src. Once these settings are changed, you need to rename the wp-config-sample.php file to wp-config.php. Note: All of the above settings are based upon the information you get when setting up a MySQL database through your control panel. I will try and detail this process as well shortly, just be aware that Lyceum does not create the database for you, this is something you need to have setup already. Update: I have detailed the creation of a MySQL database with CPanel in this article. Note: You should delete install.php after your have installed Lyceum successfully, otherwise the program could be vulnerable. You’ll be taken through two steps of the installation and ta da – disco your multi-user bloggin’. 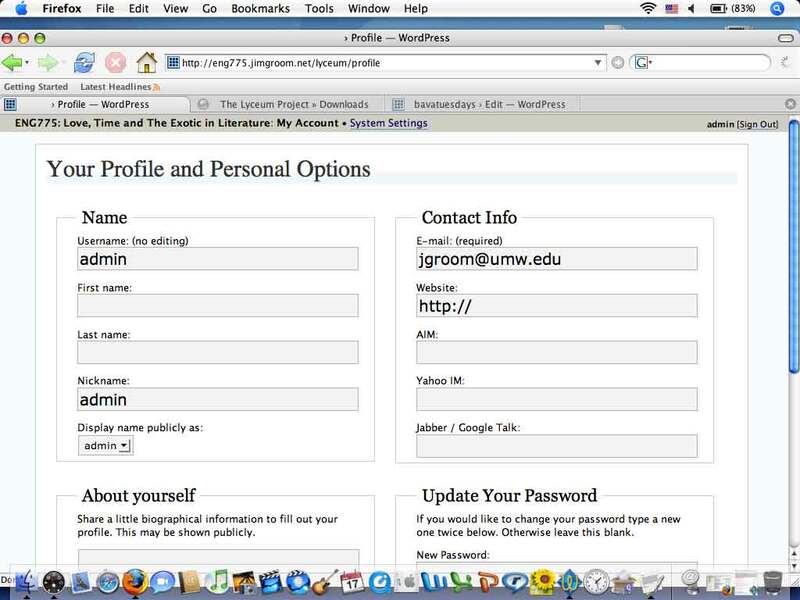 When you log in as the administrator you will be taken directly to the user profile page, wherein you can change your password, update or add personal info, and go to your blog or, as the admin, the system settings page which will be a link at the top. Also, one thing I forgot when training students on Lyceum was that you have to enable the rich text editor for writing posts on the user profile page, just check the box in the lower-left hand corner if you want to enable the RTE and then click update profile. Finally, at the top of the User Settings page is the link to either the backend of your blog, if you have set one up as an administrator, or to the system settings that allow you to administer system-wide plugins, restrict registration by email suffix, deactivate and/or activate blogs, manage blog users, as well as modify or rewrite the htaccess file if need be. Those are the system settings tools and I am including a screenshot just to give you a sense of what this space looks like. It is really not that different from navigating the backend of a single user account, and I have installed two plugins thus far on a system-wide basis and they both work fine. Keep in mind, however, that this may not always be the case. Jim – you are doing some really great work here! Since we all know and love WP, it would be great if we could easily spread the blogging opportunities with some sort of enterprise WP system. You are helping us to see what that entails – thanks! It has been my pleassure. I remembered during my first weeks here that I had promised to make in-roads with multi-user blogging, well, thank hjeavens for Lyceum, otherwise I would still be scratching my head with every nightly-build from WPMU. Your instructions were great, but I’m still having a problem. I get to the lyceum screen – welcome to Lyceum installation. I make it to the second step – everything seems fine. Do me a favor and send me the link to the site so I can take a look. Jim – is there an e-mail address I can use to send it to? When I choose “lost your password,” I’m taken to a page that says (among other things): ERROR: The blog requested does not exist or has been deactivated. But at the bottom of the page, the blog created is listed and I can even go to it. I just can’t sign in to the dashboard/admin area if I don’t have my password and the “lost password” option isn’t working. Once I get this working properly, I’d like to intall it again in the root folder (instead of subdomain.domain.com/lyceum/blog my aim is to make it subdomain.domain.com/blog.) Is that a good idea? Also, the subdomain is actually an addon domain on my host. So actually, when the DNS updates, I’ll be able to reach subdomain.domain.com just by going to subdomain.com. Will that also shorten my blog urls to subdomain.com/blog? I don’t see any installation at all in the url above? Did you uninstall it? have tried the private.php and changed the relevant path but failed to point it right. When I goto change permissions to 775 it says changed – but then reverts back to 777. Is there another way to change the permissions (i’m currently trying to change via file manager – you can see the screen here – http://img171.imageshack.us/img171/7036/cpanelyw4.jpg). Where you describe the step of setting permissions on three files, shouldn’t the second file in the list be wp-comments-post.php (commentS with an s)? That is the file name I find when I unzip the distribution file, and no file named wp-comment-post.php. You are right, it is comments with an S – there goes my pulitzer! Yes, I’ve found your installation instructions extremely helpful! Sorry about the Pulitzer, but at least you can still hope for a nice review in the NY Times. 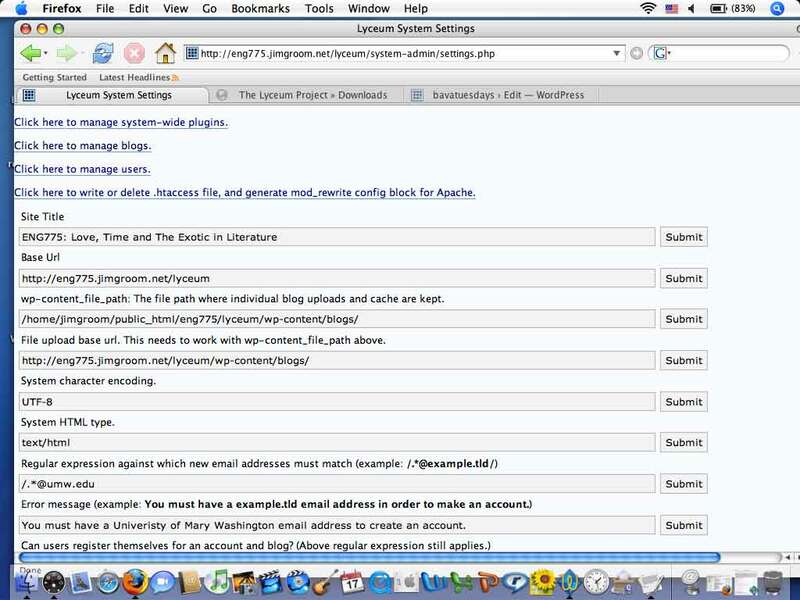 Just an insight into setting up lyceum as subdirectories of a subdomain. Also. This plays a bit of havoc with the .htaccess. So when logged in as admin go to system settings and write the .htaccess again. The default update should work. Hope that helps… now to figure out why registering emails are going astray, and why there’s no master configuration page link for admin but there is one if a user! Thanks for the insight, Stephen. Great Stuff. Now that i’ve managed to get that working, I can’t seem to login or even register – the links don’t actually take me anywhere. Any guess what’s going on there? Actually, after following Stephen’s instructions and a bit of fiddling around, it seems to be working now. Scott, you have inspired me given how far I have been from Lyceum these days to work on a tutorial for setting up a blog with dynamic subdomains. Stephens addendum is, indeed, key, and I am going to integrate it more fluidly into the actuall tutorial so it doesn’t come as an afterthought. Thanks Scott, and thanks, once again, Stephen. Wow, cool. It’s great when inspiration jumps up on you like that! I do have a question for those of you more familiar with Lyceum than I though: it doesn’t seem to be sending confirmation emails on signup. This includes the admin account. I decided to give Lyceum a try after I couldn’t get Word Press MU to do exactly the same thing, but perhaps it’s a server setting that i’m missing? I’m not certain about the e-mail problem, mine is working fine last time I checked -but i am working of an older version for the momement (hence, the inspiriation). You may want to log a ticket on the Lyceum Trac page. John and Fred are awesome and will tak a look at your concern for the particular version (or nightly build) you installed rather quickly. Good luck. Great! Thanks for the tip, and all the advice once again! In my case, when I do the install in Firefox and get to the point of clicking on the button to go from step 1 to step 2, it gives me the dialog to either download or open the file “install.php”. When I try it in IE, I get the same message Stephanie reported. Are you using the latest nightly build I linked to in the tutorial or Lyceum 0.33 stable? I have heard of this issue with nightly builds but not the stable version, make sure you are using the stable version -if this doesn’t work send me a link to your site. Yeah, itseems to be borking on the login and register pages, hmmmmm. 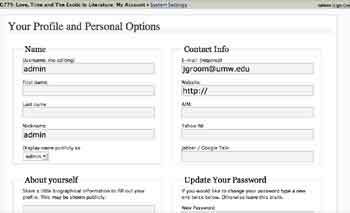 Can you login in as an admin at all? Can you see the settings in the backend? Seems like there may be an issue with the file structure, from what I can tell from my vantage point. Are you using a nightly build or a stable release? Any more info you could offer would be great, and keep in ming that there is a mailing list and an IRQ chat room for Lyceum. I used your instructions here and thought I would try my luck a bit further, it might be my system doesn’t support mod_rewrite…not sure how to test that. Yahoo! web hosting does not allow directory names with periods (‘.’) in them. 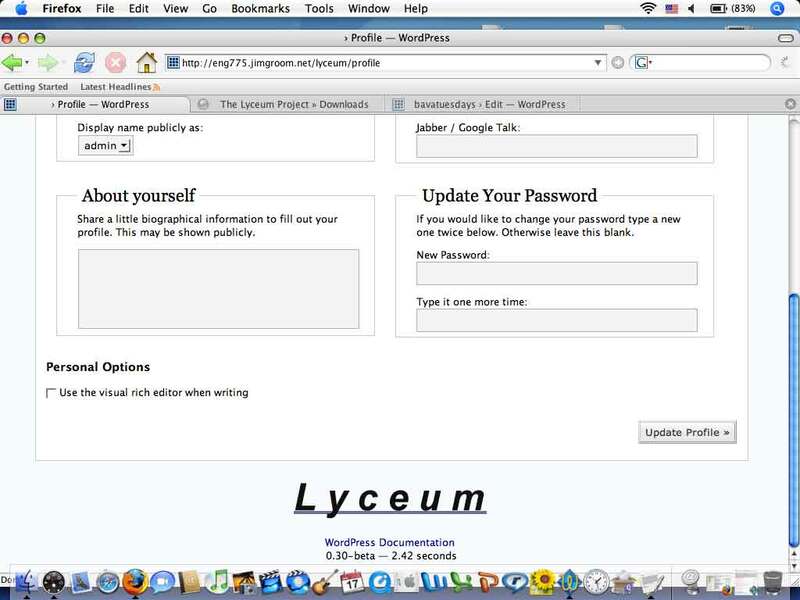 I installed Lyceum in a folder named blogs under my http://www.neighbors.in domain. Installation went well without any minor problem. I logged into the system as admin, edited my password then logged out. That’s when I had the problem. The redirection went straight to http://www.neighbors.in/portal.php instead of going to the right path. What can I do to fix the problem? Any suggestions would be very much appreciated. Thanks in advance and a good day to everyone. Hmmm, any more details. This guide is for an older version of Lyceum, and you might consider the listserv for more current support. But if you give me some info I’ll try and help. Yes I am having the same problem ..
No “installation” folder in the Src folder ..
Rather. I got WPMU to work in no time. I am currently using WordPress Multi-User, the community is quite vibrant, and while Lyceum gave me everything I need over a year and a half ago, the development in the Mu community has far outpaced it. And while John did an unbelievable job with Lyceum, in the end it is all about where the community is devoting their efforts. i would recommend you give WPMu a shot. 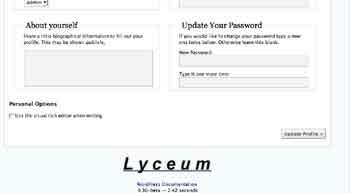 I have tried following your directions but have still been unable to install Lyceum. I contact my webhost and they cannot figure out what is wrong. We have gone through all parameters. The only problem we can see is that the download of the problem does not include and src/installation file as stated above. Instead the four folders in src are lyceum, config, lib, and bin. My Webhost believes that there may be something missing that is in the installation folder that is making it impossible to install the program. 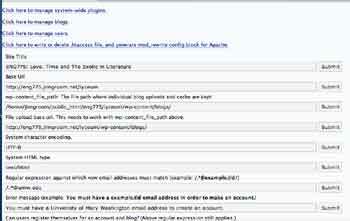 I have made all changes in the wp-config.php file as per your instructions and verified those with my webhost. I have verified that all my folders have write permissions. When I go to the web-browser and try to run the program (http://musick.us/FamilySite/Blogworks/lyceum/wp-admin/install.php), I get the message “must be writable by the webserver.” After an hour of searching forums, I tried changing the define(‘USELOGS’, true); to false. This did not accomplish anything. Any help would be appreciated as I am at my wits end and my webhost has no idea why this is not working. I too have moved to MU. I’ve installed Lyceum locally on my Mac using MAMP but everything seems to be running really slow and sometimes I get an error that says that the server is taking too long. Should there be this problem if I installed it locally? I used DynDNS to put an alias domain name too. Would there be a better way of doing that too? At this stage in the game of development of Lyceum vs. WPMu, I would strongly recommend you switch over to WPMu. The community is huge and the application has come a long way in the last three years. I haven’t really used Lyceum in close to two years, so I can only recommend a switch. I’m not really working with Lyceum anymore, it’s been over two years now. So you may want to check out their wiki, and see if that doesn;t turn up some leads.